I’ve been reading about European history–it helps to understand the news, especially now as I watch Russia expanding its interests in Eastern and Central Europe, trying to recover influence in the old Communist bloc countries. 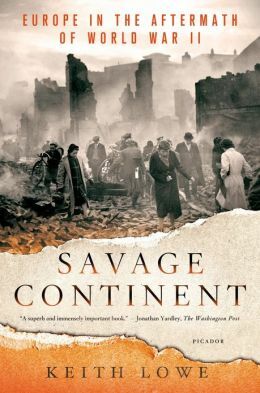 Last month I read Savage Continent: Europe in the Aftermath of World War II by Keith Lowe. As Lowe points out in this excellent book, Europe after the war was a dreadful place. Infrastructure was gone: roads, bridges, canals, railroads, and buildings had been destroyed. Governments were non-existent in many places. Partisan groups that fought the Germans were fighting each other, eager to become the new rulers. Borders had been re-configured forcing millions of people to uproot their already impoverished lives and move elsewhere. Collaborators and suspected collaborators were tortured and killed, especially women suspected of consorting with Germans. Many cities were filled with the rubble of destroyed building; for example, Lowe reports that in Budapest 84% of the buildings were damaged, 75% of Caen in France was obliterated. and 1000 villages in Greece were burned and became uninhabitable. Governments were eager to embrace the enormous task of healing and reconstruction, so they supported the myth that there had been a unified struggle against Germany. Anything that contradicted that interpretation was swept under the rug. Millions of people had been displaced during and after the war and were rounded up into DP camps where some stayed until the early 1950s, so enormous was the task of resettlement. Lowe claims that this story hasn’t been told before in this detail and for all of Europe. It’s relevance is clear as I read about the way NATO and Russia are vying for influence in the old Communist bloc countries. It makes me see Europe in a different light, with a longer perspective. This is a book that I’ll be reading a second time.